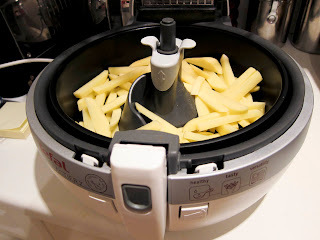 So this new gubbins, the ActiFry jobbie... it's real selling point it making chips with less fat but still crispy and nice. Better have a go at that then. 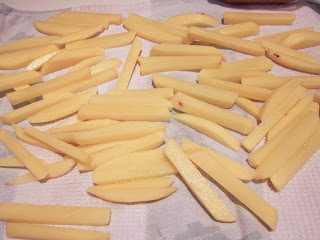 Peel and cut potatoes into approx 13mm x 13mm cross section chips. Dry them with a tea towel and put them in the Actifry; drizzle oil on top and set timer based on the weight of unpeeled potatoes. Watch the little screw thing turn them about and over. 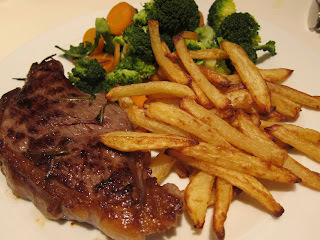 So they turned out well-cooked but not all that crispy. And I think, having read back over the booklet again properly this time, that I was supposed to wash the chips thoroughly to get the surface starch off properly and then dry them like I did. It makes a lot of sense as they were a great texture all the way through, just the outside as if they'd been sweated rather than crisped with hot air. It could also be the potato variety and the next lot of potatoes are categorised as good for making chips so we'll have another go. Don't get me wrong, they were nice! Just not crispy. Take care when using this machine. Reviews are worrying. I hope the manufacturers have sorted out the 'overheating/exploding' fan problem on the latest model. Do you think it's worth the space it takes (and the length of cooking time) for soggy chips? 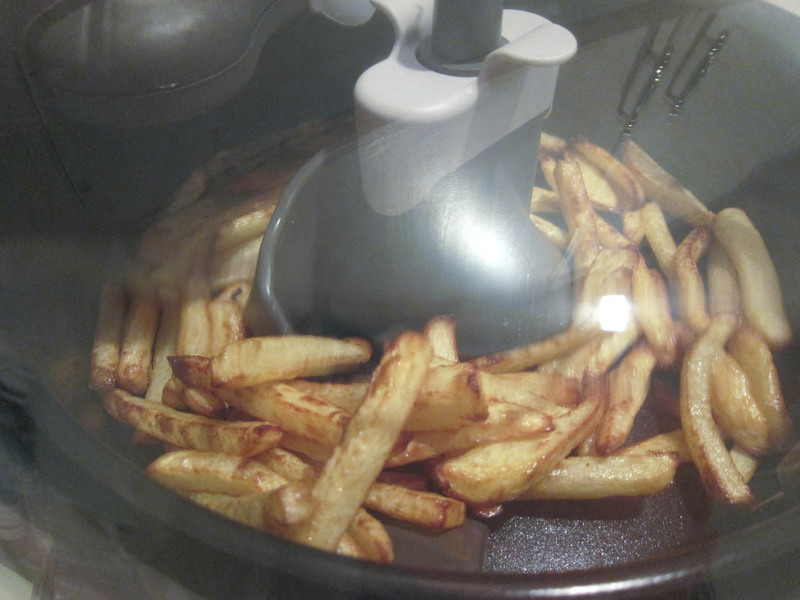 Potato wedges (or chunky-cut chips cooked in the oven are faster/crisper. Nooo idea yet. I've used it twice so far and like I said, I need to try it again with chips (and there's quite a bit more it does other than chips). The whole idea is that you use a hell of a lot less oil than you normally would in a fryer or even in the oven and if that takes a tiny bit of trial and error up front, it's massively worth it. Aaaand hand-cut chips -don't- take less time in the oven, for sure, plus they need a lot more than 7ml oil between two people. No sign of any overheating or exploding, I must say.